The DC Comics movie universe is definitely off to a bit of a rocky start, with both Batman V Superman: Dawn of Justice and Suicide Squad taking a massive hit with critics upon release. Despite that, Warner Bros. is moving ahead with the DC Extended Universe, and there are some promising things on the horizon. For as much crap as he takes and for as lame as the character was in many of his portrayals over the years, the Aquaman movie is oddly one of the most exciting upcoming releases for Warner Bros. This solo adventure is starting to take a bit more shape, as we have finally learned who Jason Momoa will be squaring off against in his first Aquaman outing. According to a report from The Wrap, the Aquaman villain in James Wan's upcoming movie will be Black Manta. 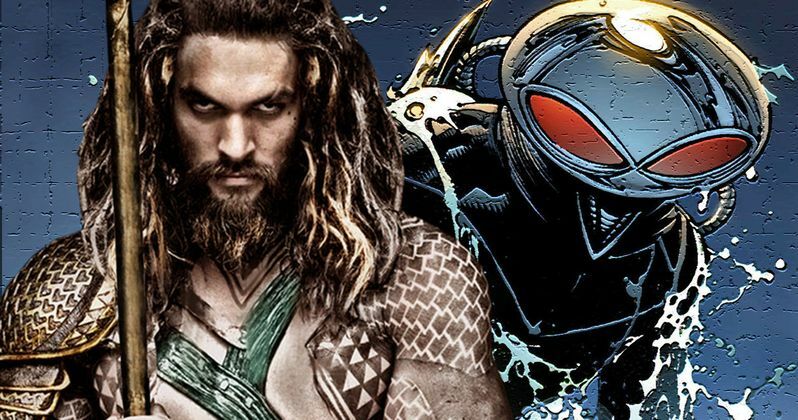 The report did not note a specific source for the information, and Warner Bros. has yet to comment on the matter officially, but DC Comics fans know, Black Manta makes a whole lot of sense. The name may not pop to people who aren't die-hard comic book readers, but Black Manta is essentially to the character of Aquaman what The Joker is to Batman, or what Doctor Octopus is to Spider-Man. Also, Aquaman doesn't quite have the massive rogues gallery of villains to choose from like Spider-Man or Batman, so the options are a bit more limited. The character of Black Manta is exceedingly dark, and has been a villain for Aquaman dating back to his first appearance in Aquaman #35 in September of 1967. Essentially, Black Manta is a man, generally depicted with enhanced strength and abilities, who wants to challenge Aquaman to rule the sea. He typically wears a high-tech suit that allows him to be under water, which also features various weapons. There are a couple of different origin stories for the character, which are very, very dark. In the 1993 origin, he was kidnapped as a boy and forced to work on a ship, and was also sexually abused by his captors. He eventually had to kill one of his captors in order to escape. In this origin, he saw Aquaman with his dolphin friends at one point, and tried to signal for help, but Aquaman didn't see him, and didn't help, so that is what sparked the hatred of the hero for Black Manta. Another origin story was given for the character in issue #8 of the 2003 Aquaman series, and it is at least as dark, if not more so. In this origin, the nameless boy who eventually becomes Black Manta is an autistic orphan, who winds up in Arkham Asylum. Anyone who knows anything about DC Comics should know, nothing good can come of that. The boy was experimented on and, as a result, became incredibly violent, even though it did seem to "cure" him of his autism, to a degree. He winds up killing the scientist who gave him the treatment and escapes. As a boy, prior to the treatment, he had a fascination with Aquaman, and was very comfortable in cold water, but felt excruciating pain under cotton sheets. It didn't help anything that his caretakers would strap him to his bed, forcing him to be in a bed with cotton around him. So yeah, pretty dark stuff. Suicide Squad was definitely injected with some lighthearted moments, but so far, the dark nature of a bad guy like Black Manta seems to gel with what is going on in the DCEU so far. Also, James Wan, who is directing the movie, has a knack for crazy visuals, and is perhaps the greatest horror director working today. So this could very well play to his sensibilities. In an interview with CinemaBlend in June, Wan teased the unique villains that Aquaman will be looking at, but didn't reveal any by name. Right now, Jason Momoa is currently filming with Zack Snyder for Justice League, and once that wraps up, it sounds like he will be taking on the lead in The Crow as Eric Draven before heading into production on Aquaman. As of right now, all we have seen was the tease of the character in the email video sent to Wonder Woman in Batman V Superman, and some footage of the character in the Justice League trailer. Even though it isn't much, what we have seen is very encouraging. We will next see Aquaman in Justice League, which comes out November 17, 2017. Followed by the Aquaman solo movie, which is set to hit theaters on July 27, 2018.